Whether it's been years or only a few months, it's always good to brush up on your dive knowledge for your safety and the safety of anyone diving with you. Answer the following questions and we will contact you with the results. 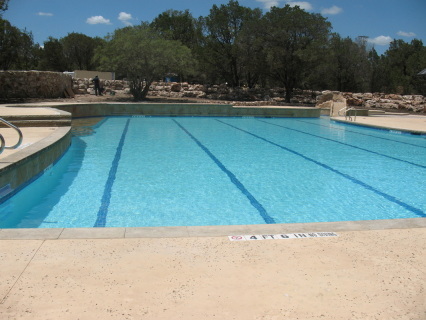 From there, we can arrange an in-person or Skype Review and/or find a time to jump in the water and review the water skills -- where it really counts. If it's been over 6 months since you've been in the water, it's a great idea, and at some dive resorts required, to do a pool refresher with an instructor prior to your ocean dives. If you've never had a DYP™ Refresher, then you're in for a treat! With our underwater communication system, you no longer have to use just hand signals. You can hear the instructor's voice through speakers you wear on your mask straps to know exactly how to improve whatever skill you're doing. This includes 90 minutes in the pool and a 30 minute academic review. Upon completion, your log book will be signed and C-card updated with an official PADI™ Refresher Sticker. Ok! Now it's time for the short quiz. For questions 28 and 29, you will need to use your PADI Dive Tables (RDP) or your eRDPML. The eRDPML is an electronic calculator used for dive planning that does the math for you, so you can focus on your dives :) If you don't have one, you can download a PDF of the RDP under the Resources column to the right. If you'd like to order an RDP or an eRDPML, you can purchase one in the Resources column as well. only when it starts to hurt. every few feet, before it hurts. ascend quickly to minimize the pain. slowly ascend or even stop to give the air time to escape. stop, slow your breathe, relax quickly ascend and have the boat pick you up. just take a nap. search for them until you find them or run out of air. search for 1 minute then surface to find your buddy. Continue dive if air and time allows. guilt them for 2-6 weeks for ditching you underwater. Don't be an idiot and poke them in the face. Don't look in cracks and crevices. Make sudden, erratic movements to scare them away. inflate your BCD so you pull free. avoid turning and struggling, and work slowly and carefully to free yourself. to make a buoyant emergency ascent. to make a controlled emergency swimming ascent. 15 m/50 ft., 30-60 m/100-200 ft. 8m/25 ft., 15-30 m/50-100 ft.
ascend to a shallower depth. slow your descent until they pass. avoid deep dives. descend slowly. wait six hours before diving again. stop diving, breathe emergency oxygen and seek emergency medical care. apply a mathematical model to determine theoretical dive time limits. read the actual amount of nitrogen in your body. you’re more likely to run out of air. people vary in their susceptibility to decompression sickness. you never run out of air. 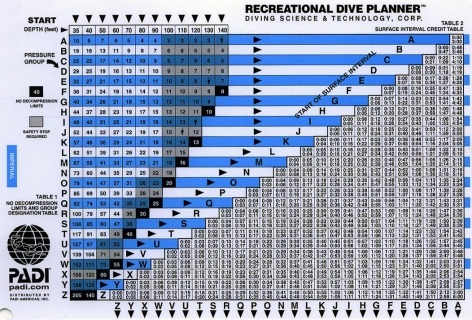 that you plan dives with tables and computers so you can make a direct ascent to the surface if necessary. from the beginning of descent to the beginning of a direct ascent to the safety stop/surface. from the time you reach the bottom to the time you reach the surface. 5 m/15 ft/3 or more minutes. 3 m/10 ft/ 1 minute. you dive to 30 metres/100 feet or deeper. you dive in low visibility. your ending pressure group comes within three pressure groups of a no decompression limit. slowly ascend to 5 metres/15 feet and make an eight minute stop prior to surfacing, then discontinue diving for at least six hours. ascend directly to the surface, but don’t exceed 18 metres/60 feet per minute. 4 m/10 ft shallower than actual. 4 m/10 ft deeper than actual. 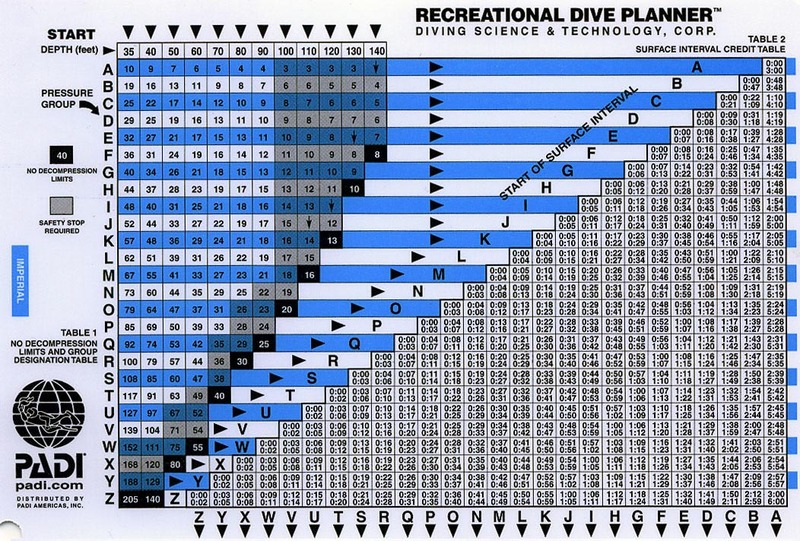 Plan your dives with this waterproof RDP slate. 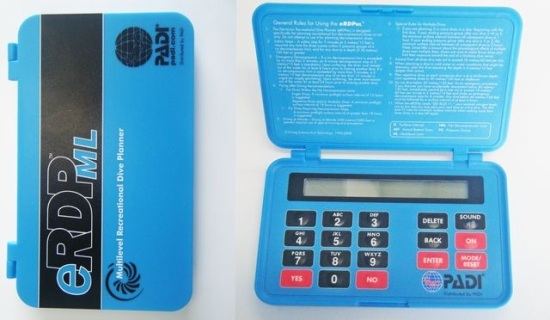 Plan your dives even easier with this water resistant dive calculator.